You want to find the best place in NYC to sell jewelry or precious stones, and especially emeralds? If you don’t want to deal with unreliable pawnshops, come to NYC Bullion – we will give you a qualified appraisal when selling emeralds and make sure you get the most pleasant, safe and transparent experience when determining your emeralds’ value. Our top-notch experts will authenticate your emerald engagement rings, emerald necklaces, emeralds rings and any other emerald jewelry in no time, using only officially licensed scales. 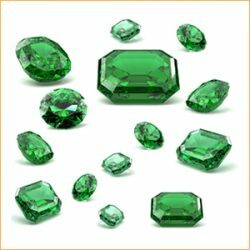 Moreover, each emerald piece is graded according to their color, inclusions, cut, clarity, and carat weight. With NYCBullion, cashing for emeralds is an easy and comfortable process – sell emeralds with full confidence today – by visiting us at our store in the Diamond District. Still searching for the perfect place to sell emeralds and receive the best cash payout? Visit NYCBullion, in the center of NYC, and let our trained qualified personnel appraise your authentic emerald jewelry. The assessment process is entirely transparent because it’s performed right in front of you. When you sell emeralds, you can feel safe and secure that they’re in qualified hands – our experts will make sure you receive all the important details about your emerald assets. Don’t go to any unreliable pawnshops or local jewelry stores. Visit our reputable location, with our official standard practice and unparalleled expertise, to get your honest and generous cash payout today! When it comes to selling emeralds, we guarantee you have come in the right place! At NYC Bullion, we offer you the opportunity to choose the best ways to get cash for emeralds: online and in store. By checking the “Get an offer now” form and providing the necessary details, you will shortly receive your quote through email. Or, you can select a face-to-face assessment at our store located in the heart of NYC, in the Diamond District. Simply visit us, and you will get a free appraisal of your valuable emeralds assets in no time! Our qualified jewelers will happily assist you and give you detailed guidance on your emeralds’ value and their authenticity. Don’t hesitate, get your online or in-store offer now from NYC Bullion! We buy emeralds that are 100% Not Synthetic, in other words, only Real Stone emeralds! This is an important thing to keep in mind when you decide to sell your emeralds to us at NYCBullion. We accept only real stone emeralds for cash payouts, not synthetic emeralds. What is a synthetic emerald? It’s an emerald produced in laboratories that has the same chemical composition as natural stones but carries “synthetic” appearance, like perfect color, shape, and no inclusions. Almost 99% of natural emeralds have inclusions, even though these aren’t visible to the naked eye. Also, another important factor of emeralds’ authenticity is that vivid green emeralds are extremely rare and highly valuable. So, if you find yourself with a completely clear and too-vivid colored emerald, it is more likely that it is a synthetic emerald, which we cannot appraise or buy. To identify whether your emerald is real or synthetic, check the brand that designed it – if it’s a well-known wholesaler, like Macy’s, you most likely have a synthetic emerald. Natural emerald stones are used by highly reputable jewelry brands because their value is much higher than diamond stones. If you decide to sell your emerald, make sure it’s an authentic one by checking all the above parameters.